Some people are already seasoned experts in real estate and just want to pick up more literature to round out their skill set or learn some new strategies. However, for the most part, many are just beginners and looking to get their feet wet and don’t know where to start. If that is you, then this book is absolutely the best for newbies in investing in properties. 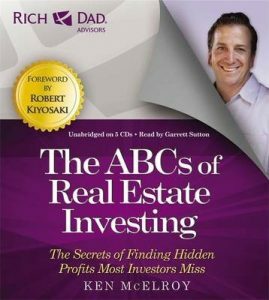 Appropriately named The ABCs of Real Estate Investing, this book from the Rich Dad series is great at giving you the rudimentary knowledge that you need to get started. From that point on, there are more specialized books that you can move on to, but only after you understand the basic fundamentals that you can glean from this book. I will start this review out with the caveat that if you are looking to purchase single-family homes as a rental property, then this is not the book for you. While many of the fundamentals and general real estate terms in this book will still apply (and build your knowledge base), it is more geared towards the purchase, management, and sale of apartment buildings. It is similar to this book, in that regard. If you are more interested in single-family rental properties to build your real estate portfolio, then this book is much more suited to your interests. The ABCs of Real Estate Investing: The Secrets of Finding Hidden Profits Most Investors Miss is a rather quick read at just over 200 pages, but it does well to give you the basics in an easy to understand manner and prepare you to get started building your wealth with this kind of investment. It certainly isn’t the most comprehensive or technical book available, but it is very well suited for beginners to learn the basics. I will say that there are some gaps in the information, however. It glosses over the financing aspect of any real estate purchase. It more goes straight from evaluating a property and right into ownership, with little said about how to obtain the funds to make the purchase. There are others that cover that area more in-depth. Other than that omission, however, it is pretty solid at providing the basics. It is especially effective in teaching property valuation so you can derive the appropriate price, negotiate a great deal, and make the most return on your investment.